Per the USDA, it is illegal to sell poultry in the U.S. that was raised with added hormones. So why does Progresso use language like “No hormones added ever” in its commercials and on its website? It’s not about consumer education. In fact, it’s just the opposite. 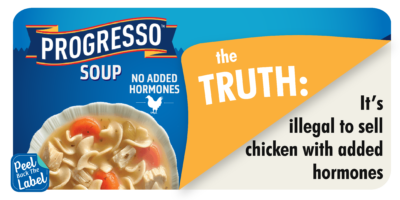 Progresso uses deceptive tactics like these to sell more of their products by capitalizing on consumers’ lack of knowledge, misconceptions and concerns about the safety of their food. It’s clear that Progresso knows it’s touting a distinction without a difference in hopes that many consumers don’t read the fine print – and falsely assume the “No Hormones Added” language means Progresso’s product is safer or healthier than similar products that don’t carry this deceiving label. And just in case you’re wondering who pays the price? That’s right – consumers. Want to tell Progresso to stop the fearmongering? Call them out on their Facebook page.